An ancient medieval castle, which is one of the best preserved manors in Italy, considered the most magnificent among the castles of Trentino. There are 150 rooms you can visit in this castle and the view from the room windows overlooking Val di Non is truly spectacular. It is nestled among apple trees and reachable by car. Castel Thun is 3 km from the B&B Pra da Lares. The city, best known for the Council of Trent, was built during the Roman period. The large historical centre with its maze of streets and alleyways centres around the Cathedral of San Vigilio in the square of the same name and Praetorian palace. You can find the Fountain of Neptune in the middle of the square. Trento is a university city full of young people with plenty of cultural events, exhibitions and concerts. There are numerous annual events such as the Trento Film Festival della Montagna, the Festival of Economics of Trento and in December in Fiera square, the Christmas Markets. 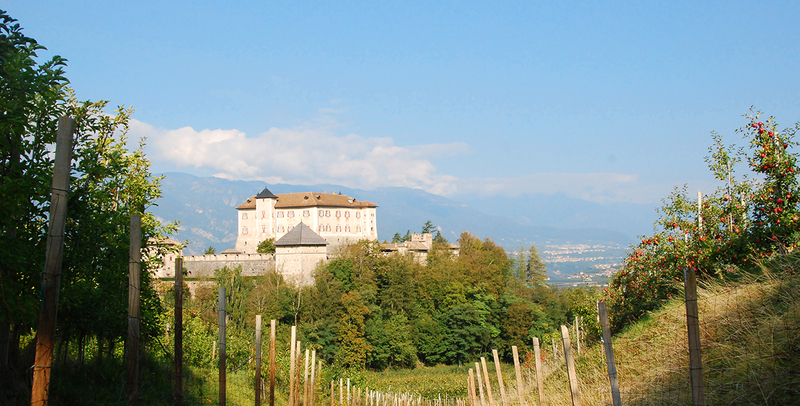 The imposing Buonconsiglio Castle in Trento, formerly used as the residence of the bishops but today, it houses several museums and temporary exhibitions. The Muse, Museum of Natural Science, designed by Renzo Piano, offers an in-depth look at nature, especially the mountain landscape. Trento and its museums can be reached in 20 minutes by car or train from the B&B Pra da Lares. The hermitage is a charming sanctuary built on a rock spur. A stairway leads you to five small churches built next to each other. According to legend, Romedio lived on this site in the company of a bear. It is most interesting to reach San Romedio on foot following a path carved out of the rock. San Romedio is reachable by car from the B&B Pra da Lares in 20 minutes. There are numerous castles of Val di Non, the valley of apple orchards and castles, Castel Belasi, Castel Cles, Castel Bragher, Castel Nanno, Castel Valer, Castel Malgolo and Castello d’Alta-guardia.